Among the rice eating community here in Asia, the Japanese are possibly the ones who pays the most attention and dedication to the types and quality of rice they consume. The myriad of Japanese rice varieties available at the Japanese supermarkets fascinates me. A couple of months ago, I bought 3kg of Japanese short grain brown rice at the Japanese supermarket just so that I could use the rice polishing machine there. By turning the knob on the machine, I was able to select the different degree to which I would like my rice to be polished. Last month, during the Chinese dumpling Festival, someone was raving to me how the Japanese short grain glutinous rice makes really tasty sweet dumpling. During my last trip to Japan in April, my Taiwanese colleague had the gall to ask me to help him lug back the latest electric rice cooker that cost US$400! The latest model by Zojiroshi (the elephant brand) , it came with vaccumm and high pressure features that cook each rice grain to the core (including the harder brown rice) in a shorter time to yield a more fluffy and bouncy texture. I was intrigued, ...I was...but alas the voltage setting does not work in Singapore. Sigh, yes, almost all things made in Japan are good, (I hear protests over the recent Toyota debacle). Their dedication to and appreciation for quality and perfection are almost always reflected in the things produced in Japan. 2 weeks ago when I was on my business trip in China, I had the opportunity to spend 2 days in Hong Kong while I was running between southern China and Shanghai. One of my favourite haunts in Hong Kong is the City Super Fine Food super market. This time, I must have spent close to 45mins, lingering over the Rice and Grain Section, peering at the different types of Jasmine rice, Arboria rice, Taiwanese short grain rice (these are also becoming really good) and the huge selection of Japanese rice stored specially like good wine in a dedicated refrigerator. I was particularly drawn to the short grain white glutinous rice and black glutinous rice. 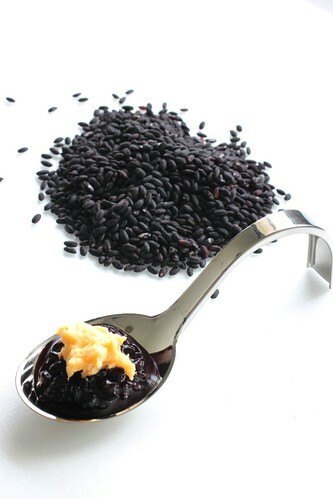 The Japanese short grain glutinous rice grains were snow white with a lovely luminescence while the black glutinous rice were jet black, plump and looked more like black sesame than rice. I had really wanted to get both but that would add weight to my luggage and I still have more than a week's travel to manage. In the end I chose to only get the black glutinous rice and for the rest of trip, I was contemplating about what to do with them when I get home. I am not very familiar with black glutinous rice recipes. The last black glutinous rice dish I had was 2 months ago in Taiwan when they served a black glutinous rice meat dumpling (紫米粽). It was really delicious (I think I still have 2 dumplings in my freezer!) and it did not make me feel bloated as normal glutinous rice would. Then there is the popular SE Asian dessert Pulut Hitam - which is Black Glutinous Porridge with Coconut Milk. It is a relatively simple dessert to prepare but is also rather uninteresting. It was only after poring over Forest Leong's Thai dessert, Mango sticky rice that I had my inspiration. Instead of water, I chose to cook the black glutinous rice in clear coconut juice. This imparts a refreshing, natural fragrant sweetness to the the porridge. When the rice was cooked, I stirred in minimal qty of coconut cream and served it with a dollop of seasonal durian pulp. 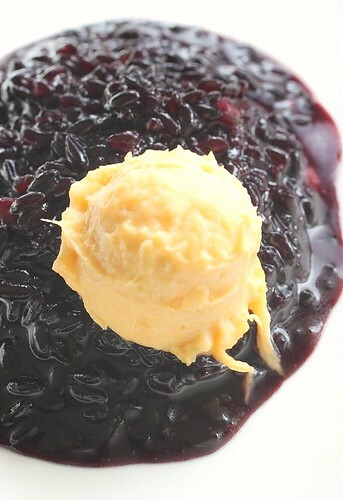 As the durian season is at its peak, the fruit is very sweet and complimented the black glutinous rice rather well. 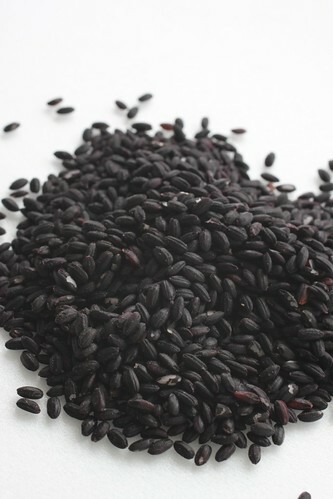 So, if you know of other black glutinous rice recipes, please do enlighten -I am looking forward to experiment with the rest of my short grain black glutinous rice. 2. In a pot place drained black glutinous rice, coconut juice, pinch of salt and sugar (I did not add sugar as I was happy with the natural sweetness of coconut juice) and pandan leaves. Bring to boil, lower heat to medium and continue simmer for 45 mins. I did this without covering the pot. If the water dries up, add more coconut juice or water. 3. When rice is cooked, (I cooked to soften with an al dante bite - some may prefer this to be more 'mushy') stir in coconut cream at low heat. Bring to low simmer for 2 mins. Remove from heat and cool down a little if preferred and serve with a dollop of durian pulp. Beautiful looking black plump rice! I always love pulut hitam if only the rest of the tummies are into durian too. Good work! It's common for the Malays to eat glutinous rice with durian sauce, but not the black type. Great idea to use black glutinous rice instead. Hey, heard of black glutinous rice chiffon??? Some bloggers have done that. That's a beautiful dessert.......with durian....mmm..should be A1!! Beautiful colour combination...black and yellow. I've never had pulut hitam with durian pulp. This is interesting to note. Can you actually buy rice in other countries and bring it into S'pore? I thought it's one of those restricted and controlled items.The black grains look perfect. I actually don't quite like our local variety. Most of the grains are crumbly inside the packet. What beautiful grains! plump adn chubby. i have never thought of cooking with coconut water. I mustt try that one f these days. Very interesting .pulut hitam with durians must be very good. I can imagine. Shirley, I just told my colleagues yesterday that I ve craving of pulut hitam and u came out this, somemore with durian pulup, so interesting and yummy. I am going to cook this wkend and b4 tat need to get mao san durian. 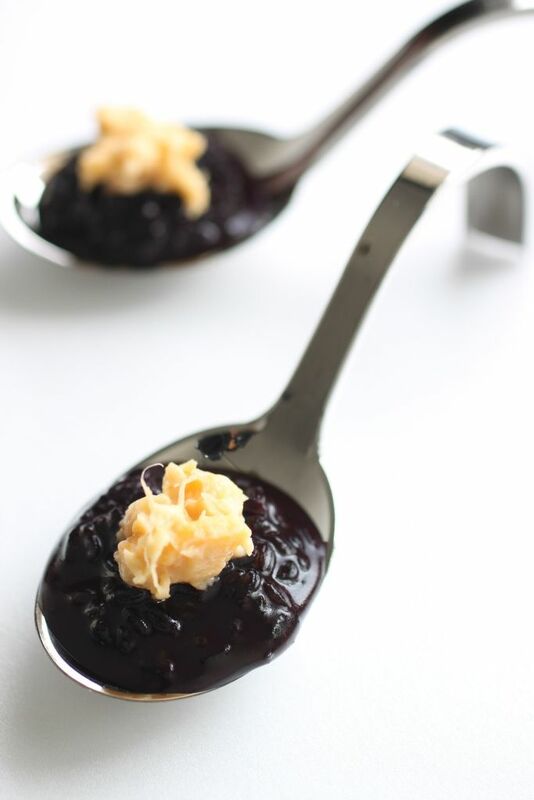 Make pearl dumplings with black glutinous rice. It'll look beautiful! On my recent trip to Perth, I stayed in a hotel and ordered room service entree. They serve black glutinous rice with pan-seared prawns in cream sauce. Pretty amazing stuffs really! I love Bee Koh Moey which is essentially BGR cooked in coconut milk. Grew up eating that. Also can try use BGR and make kuih, I think a mixture of black and white glutinous rice would give a new twist to classical kuihs. You know how I can be crazy with flavours and bang on ideas. Try it!!! Thanks Quinn! 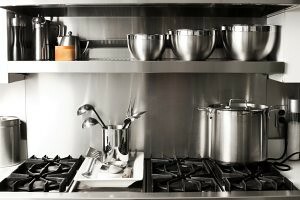 I actually tried steaming the BGR like what we usually do with WGR but they don't turn soft or sticky - I am going check out a few more recipes. Hey what are pearl dumplings? They look so pretty! 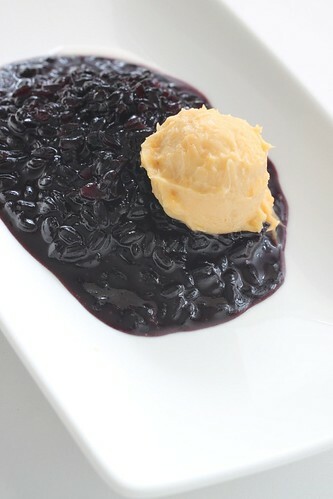 Black glutinous rice with durian...that's spectacular! Oh my this looks stunning!!!!!! so simple and yet so elegantly executed! just fabulous! Thanks for sharing your rice experiences, hehehe, I have learnt a good lesson about rice from you. Your black glutinous black look just awesome and beautiful. I wish next time I can able to buy some of this as I also a glutinous rice lover. Very interesting combo! Some people like to eat durian with plain white rice and I always thought it's weird. This definitely sounds better than white rice. Oh, yes! Durian is at its peak now. I'm still contemplating whether to buy some to use or not, though I don't mind eating durian on its own. I'm also worried about my waistline here and having myself overheated! Haha! You do eat ice cream, right? How I wish I can buy an ice cream maker, or even Paco Jet! We actually can only get this kind of black glutinous rice here. Can't find the long grain one. I've used a mixture of white and black glutinous rice to make kuih seri muka/kuih salat. They actually taste really nice.